Aliki Dourmazer was born in Thessaloniki, Greece. She has a Bachelor Degree in ‘Theatre Studies‘, specializing in Physical Theatre, (BA Hons) and a Master of Arts Degree (Distinction) in ‘ Ensemble Physical Theatre: Training and Performance’ , University of Huddersfield, Great Britain. She is an Assistant Director, performer and Vocal trainer of the International Ensemble ‘DUENDE’ with Artistic director John Britton, based in Great Britain (2010). She organizes Ensemble Physical Theatre workshops all over Greece with John Britton since 2010, where she teaches ‘Pleasure in Voice’. In May 2013 she participated with DUENDE, as a ‘voice and performance’ teacher and director, in the project ‘Frankenstein- Performance and Installation’ of the ‘Drama Department’, University of Huddersfield, UK. She was trained by Phillip Zarrilli in Psychophysical Theatre (Huddersfield and Wales) and in Ritual Theatre by Nicolas Nunez, “Anthropocosmic Theatre”. She has been trained in intensive workshops in Gr. Britain, Wales, France and Greece: Alexander Technique (Dr. Don Weed), Freeing the Voice (Chris Coe), The Powerful Singer (Moira Smiley), Kalarippayattu Martial art & Yoga – psychophysical actor training (Phillip Zarrilli), Ritual Theatre-Anthropocosmic Theatre (Nicholas Nunez), Commedia del’ arte (Olly Crick), Physical Theatre (Thomas Mettler) , Bioenergy actor training (Μ. Μarmarinos), Physical theatre and Japanese Actor Training (S. Mixopoulou, Attis Theatre), Asthanga Yoga (Danny Paradise). She is largely influenced by her extensive training on Ensemble Physical Training & Improvisation (John Britton – director of Master in Arts ‘ Ensemble Physical Theatre’, University of Huddersfield). She has been working in the theatrical field since 1999 as an actress, performer and director in Physical Theatre and has taken part in Theatre & Art Festivals in Greece and the UK. She has worked as an actress in theatre stages in Greece – Athens, Thessaloniki, Lesvos and Crete – and the UK. She has been continuously teaching Physical Theatre and Voice since 1999 in Athens, Thessaloniki, Komotini, Lesvos, Crete (GR), Larnaka (Cyprus), University of Huddersfield, University of Oldham(UK), Geneva (CH) and Pisa (Italy). Her workshop ‘Voice is the Body’ was part of the 3rd Biennale of Contemporary Art in Thessaloniki. The last 4 years she is investigating the dynamic relationship between Movement and Voice through the Pleasure Principle in a series of workshops and solo performances, as well as a part of ‘DUENDE’ theatre research and performances around Greece and England. The latest research projects she co-organized and worked as vocal trainer and vocalist/singer was the 1st & 2nd Residential Workshops ‘Ensemble Physical Theatre- Performing at the Edge’ in Lesvos, Greece with John Britton (2012-2013). Her latest physical theatre performances with DUENDE was ‘Τhe Shattering Man – Creative Development’, based on the play Macbeth, Huddersfield, UK (June 2013) and 10 Improvisation Performances ‘Collission’ (2012-2016). She is teaching Voice and Singing in the ‘Duende School of Ensemble Physical Theatre’ in Athens (2015 -2017) as well as proposing the song material of each final show. Her last research project was the Solo Performance ‘MEDuLA’, based on Medea by Euripides, with live music on stage by Paolo Zebolino (April 2014) opening in Geneva, and touring to Thessaloniki, ‘Studio Vis MOtrix’ (2014) and Athens, theatre OLVIO (2015) with musician Thanasis Gamarazis. 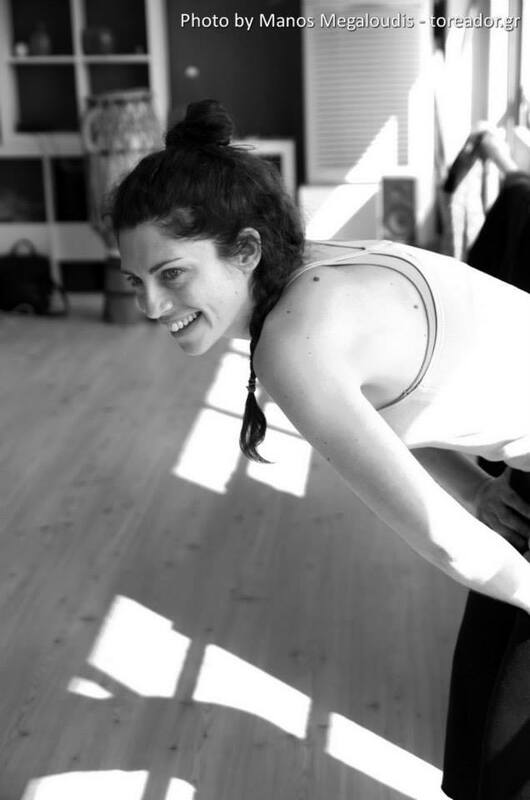 She lives in Thessaloniki where she founded the school of Physical theatre and Voice, ‘Present Being Performer Laboratory’ (2014) for professionals and amateurs. Including contemporary dance training by Alexandra Tsotanidou and acrobatics by Lucia Lonegro. Each academic year completes with staged performances by each year’s students. She continues to travel abroad for collaborations and workshops and runs a yearly workshop program in Athens.